After an extended period of neglect CAMBRIA began a programme of extreme reconstruction in September 2007. This largely returned her to her configuration at build in 1906. 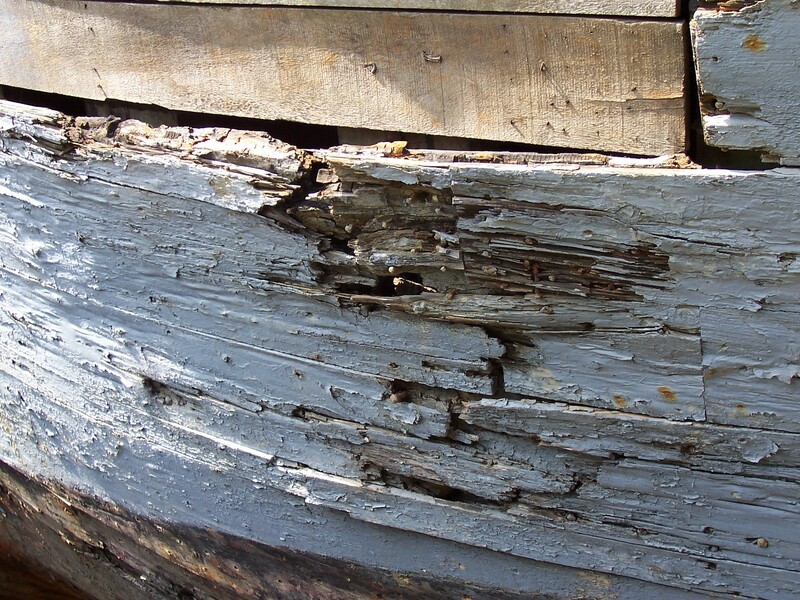 At least 90 per cent of the barge timbers needed to be replaced. 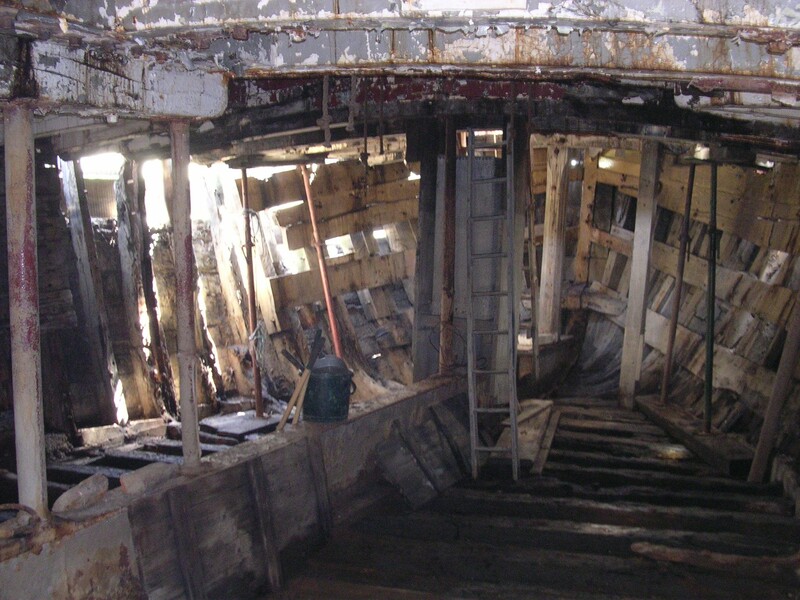 Large sections of the deck were removed to expose the original interior of the barge. This was done using sawn oak, along with quantities of pine and elm. 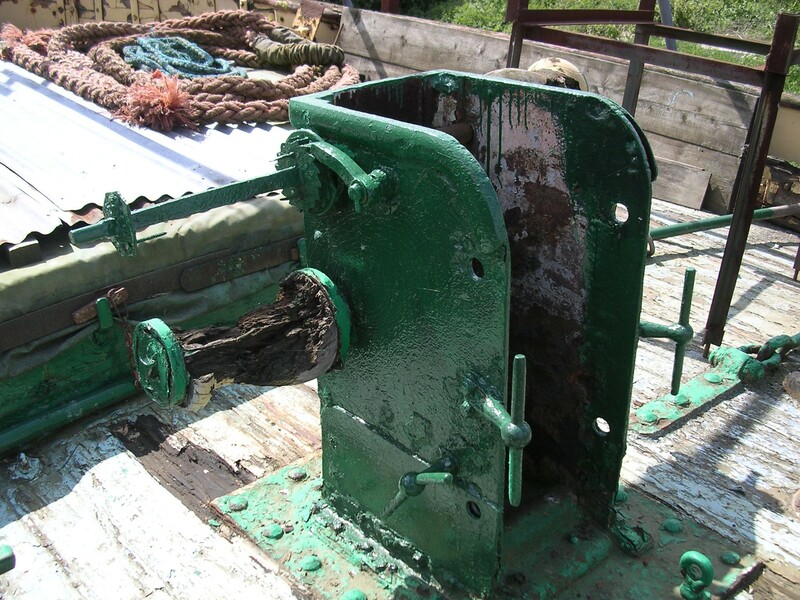 Her steel keelson was found to be severely corroded at each end, and could not be saved. 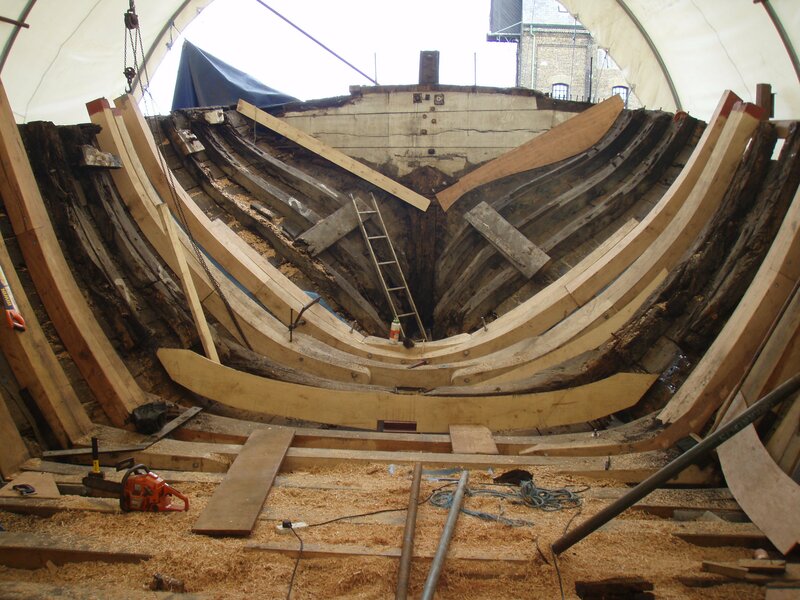 However, the original keel and floor were in excellent condition, and formed the solid base from which reconstruction could be carried out. Many of the original trunnel or trenail floor bearer fastenings were as new. 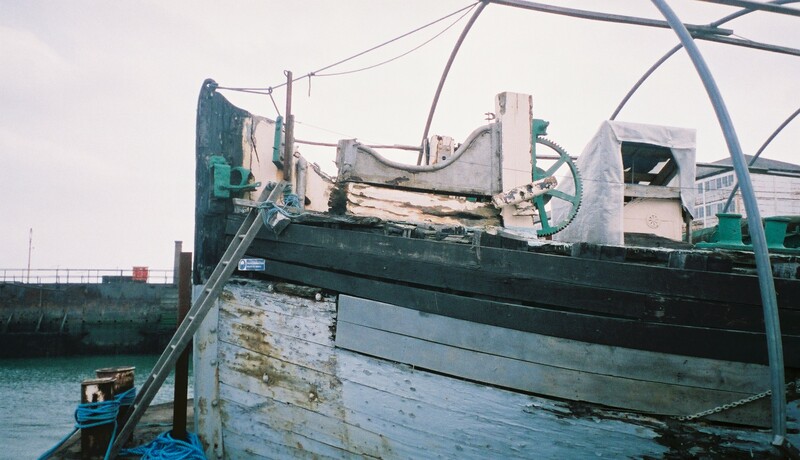 New oak floors and side frames were fitted, and the stem and stern post were lifted to return the full sheer to the barge. The old after deadwood was totally removed and replaced with a new timber 20 feet long. The forward deadwood was also replaced. Many new curved oak sections had to be fabricated and installed. The inner wales were extended and the first sections of outer planking fitted and fastened with galvanized spikes. The process was repeated for the second layer of planking. Joints were staggered and the two layers sealed with a felt, hot tar and horse manure mix. The interior accommodation and rig have been replaced in their entirety. The main hold coamings and side decks have been removed, and extra supports have been added to the side planking. After the reconstruction work was completed, no engine was installed and the vessel is operated under sail alone as per her original build specification. CAMBRIA is closely associated with the Thames and Medway regions. She regularly sailed between the two, but also to other ports from the Humber to Cornwall carrying a variety of freights. She also participated in races, winning awards in the coasting class of Thames and Medway matches both before and after the First World War. During the War she sailed from London and the Medway to the Channel ports carrying pitch, coke, wheat and oil-cake. CAMBRIA became the last British registered vessel to carry cargo under sail alone. By 1970 this had ceased to be viable and her last freight was cattle cake from Tilbury to Ipswich. She was sold to the Maritime Trust with the intention of displaying her at St Katharine Docks. The Trust had been started by the Duke of Edinburgh in 1969 as a means of preserving significant British vessels. Unfortunately quick action was not possible and her condition deteriorated badly. In 1987 CAMBRIA was taken over by the Cambria Trust, and converted into an education centre. She has been recorded on the National Register of Historic Vessels since 1996 and is on the National Historic Fleet. 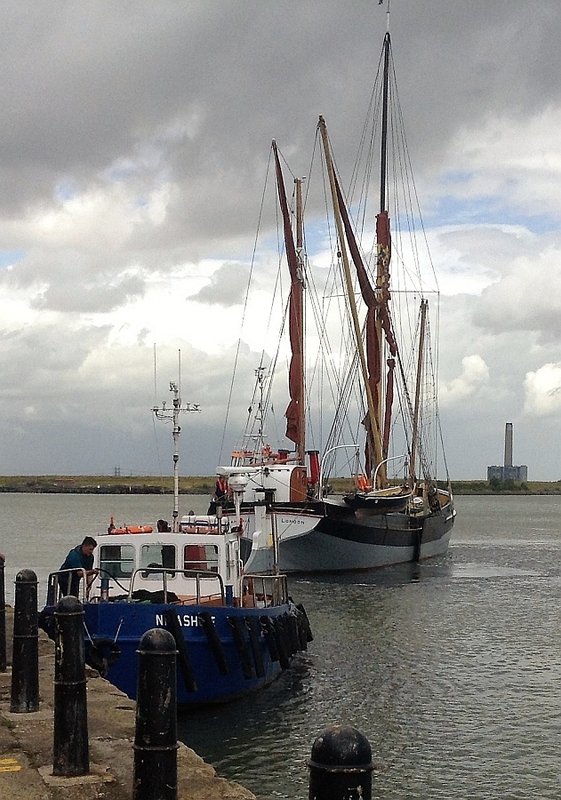 CAMBRIA was built with a shallow draught to allow her to navigate the waterways of the East Coast and Thames. 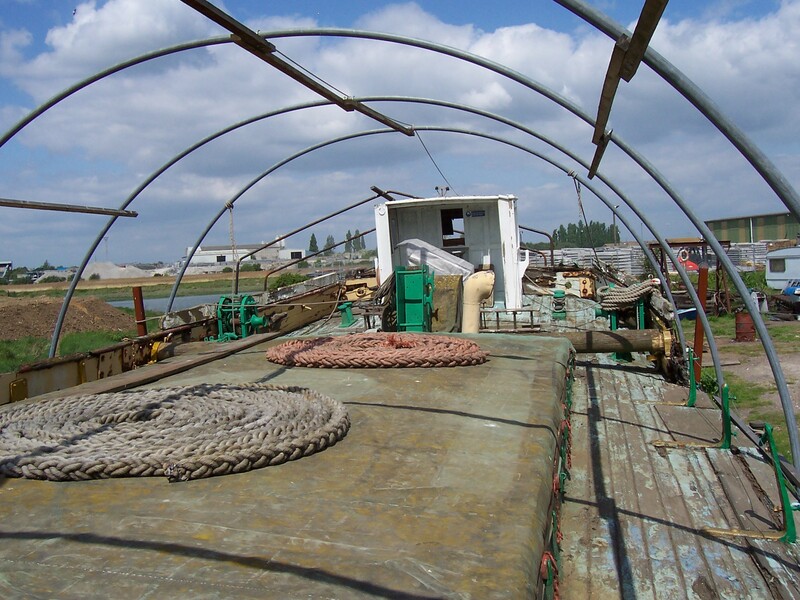 As with all other Thames Barges, her flat bottom and use of leeboards on both sides of her hull allowed her to take the ground safely when loading or discharging cargo. 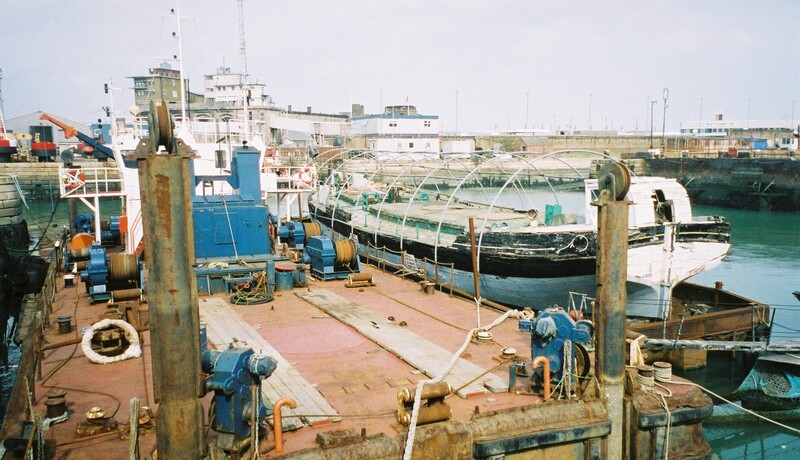 Her central hold, now sympathetically converted for use as accommodation, was used to carry cargo, whilst her length and broad beam gave her maximum capacity. 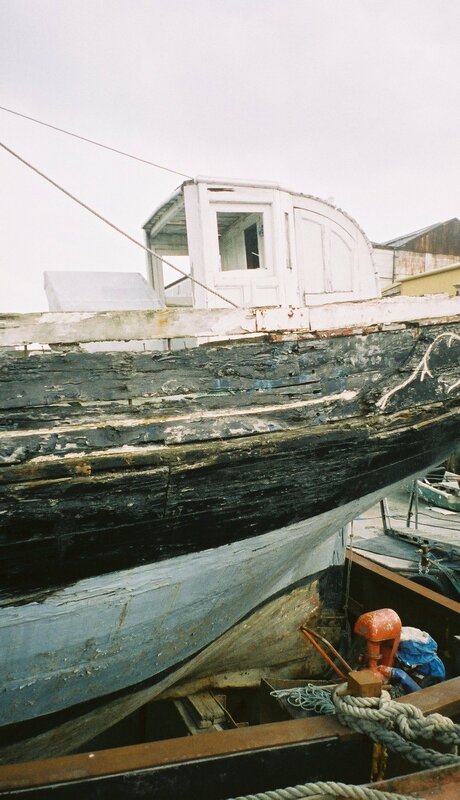 When originally built CAMBRIA was fitted with a wheel shelter with a tiny toilet in the whaleback. 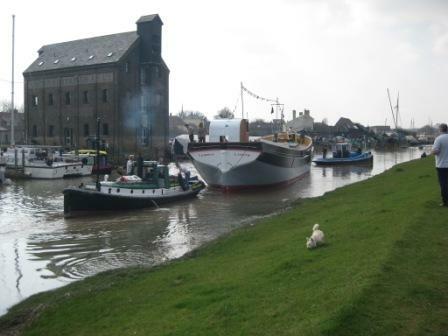 She remains operational in her working environment, being based at Faversham. 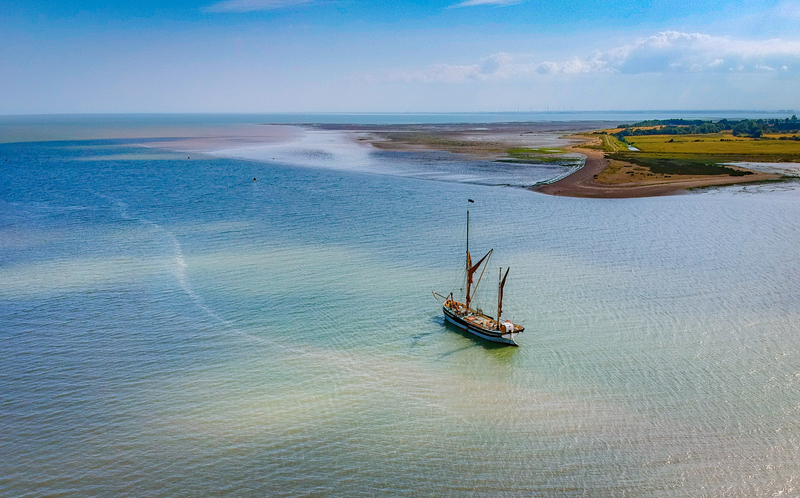 She acts as a floating classroom, including social outreach programmes for disadvantaged youths, at a variety of locations on the Thames, Medway and Swale estuaries where she historically traded. 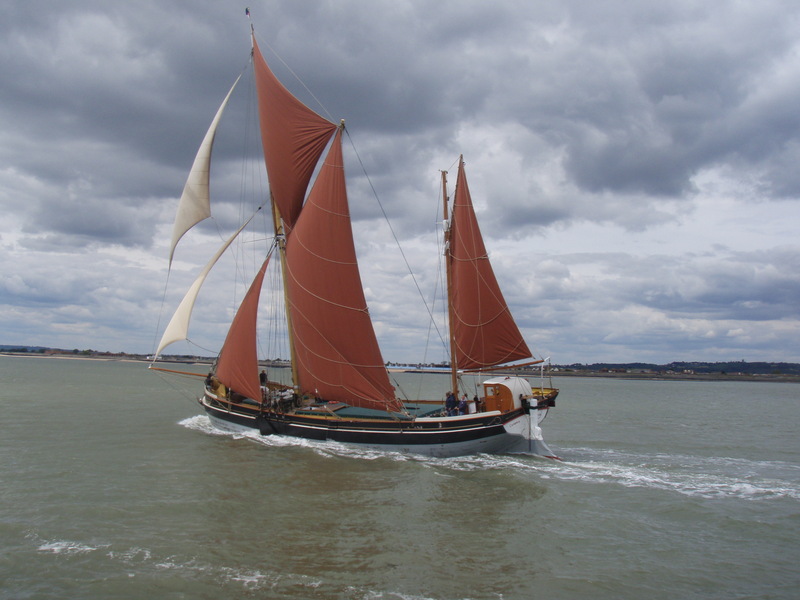 She regularly visits Whitstable and Southend for day charters, and is also used for sail training. Source: NHS-UK team, 16 November 2016. The London barge-builder and owner Frederick T Eberhardt, who had established a yard at Greenhithe, asked his two sons William and Frederick to build a barge each, following their apprenticeships at the Fellowes yard in Great Yarmouth. The result was two identical coasting mulie barges, CAMBRIA andHIBERNIA, and both were launched on the same day at Greenhithe in 1906. William had built CAMBRIA for £1895, whilst her sister barge cost £1905. Despite their similar construction CAMBRIA was slightly faster than HIBERNIA and came second in the coasting class in the Thames and Medway matches in 1906. ‘Brusher’ Milton was CAMBRIA's first skipper. He recalled one occasion when she arrived in Dover an hour ahead of a steamer which she had overtaken on her way up the Channel from the Solent. ‘We were doing nine knots’, said someone on the steamer, ‘and we couldn’t hold you’. 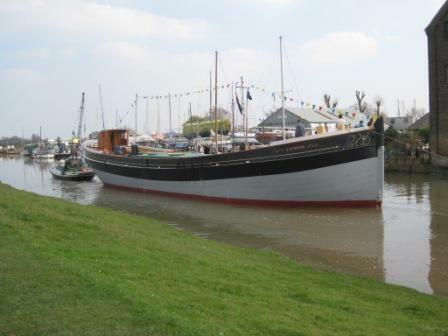 In the first barge matches after World War I, in 1927, she came first in the coasting class on both the Thames and the Medway - and no fewer 34 barges had competed in the Thames event. In the following year she again won in the Medway coasting class. In both 1935 and 1936 she came second in the coasting class on the Thames, and came second in 1936 on the Medway. In 1938 she again won the coasting class in both the Thames and Medway matches. Eberhardt changed his name to Everard and his company, F T Everard and Sons Ltd, became one of the largest and most successful in the coastal trade. Both CAMBRIA and HIBERNIA were successful and profitable barges, but HIBERNIA was lost near Cromer in a fierce north-east gale in 1938 while on passage from the Humber with a cargo of coal. CAMBRIA regularly sailed from the London River to the Medway, and to many different British ports from the Humber to Cornwall. On these routes she carried a variety of freights, including wheat, barley, rice, oil-cake, sugar, Portland stone, ball clay, timber, and iron pipes. One of the most frequent cargoes was coal from Keadby on the River Trent to Harwich, Colchester, Margate and the gas works on the Thames. She also regularly traded cross-channel to Dunkirk, Calais, Boulogne and Le Treport with coke, coal, pitch, wheat and oil-cake. Fully laden she could carry 170 tons, which gave her a freeboard of only 11.5 inches, and her decks were frequently awash - making a hazardous working environment in the testing conditions of the Channel and the North Sea. CAMBRIA was built with the luxury (among sailing barges) of a wheel shelter with a tiny toilet in the whaleback of the shelter. Most barges had an open wheel and a ‘bucket and chuck it’ toilet. Bob Roberts became skipper of CAMBRIA in 1954: he was a grammar school boy from Poole who had run away to sea in the barquentine WATERWITCH at the age of fourteen. In 1955 CAMBRIA had a record year, loading maize, meal, cattle cake and wheat between London and Yarmouth or Norwich. Occasionally she loaded palm kernels back from Felixstowe Dock to Erith oil works. In twelve months she loaded 30 freights, yet had six weeks off preparing for the barge matches. Her best passage of the year was from Yarmouth pierheads to Northfleet in 12 hours. In the 1950s she had six or eight coal freights a year from Keadby to the gasworks at Harwich, Colchester and Margate. By 1959 this trade had been lost and most of CAMBRIA's trade was to Yarmouth or Norwich, with occasional visits to Mistley and Ipswich. 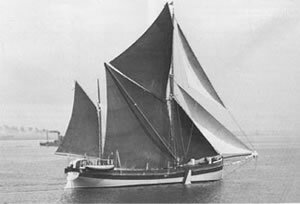 In 1959 there were only six barges trading under sail alone, plus about a dozen auxiliary barges sailing without mizzens, and by the end of 1961 CAMBRIA was the only one left trading under sail alone. By 1966 Everards had moved out of sailing barges altogether and in that year Bob Roberts bought CAMBRIA from them and continued to trade in her for a further four years. During all this time the barge had no engine, and indeed one has never been fitted to this day. At first CAMBRIA had had a crew of three but to remain economic this had for many years been reduced to two – the skipper and mate, though they were aided by Roberts’ Welsh collie Penny, who would bark in fog if the barge was approaching any floating object. Bob Roberts was a colourful character, an outspoken bargeman, folk singer and author. CAMBRIA became the last British registered vessel to carry cargo under sail alone. By 1970 this had ceased to be viable and her last freight, in that year, was cattle cake from Tilbury to Ipswich. Captain Roberts sold CAMBRIA to the Maritime Trust for display at St Katharine Docks in London. 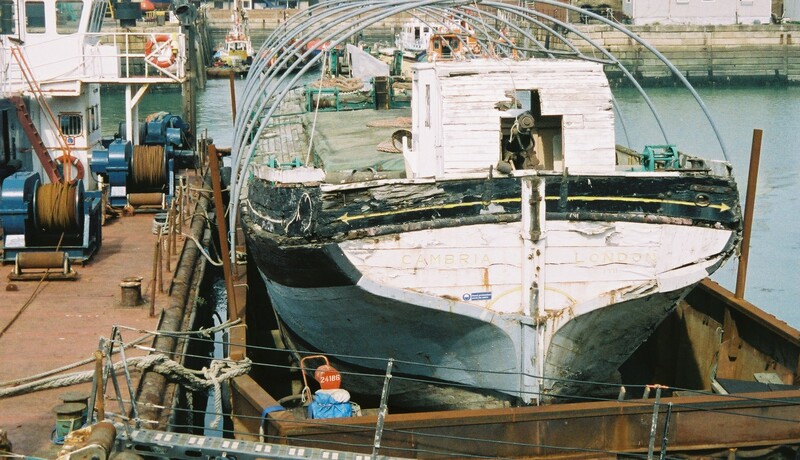 Her condition deteriorated badly and in 1987 the Maritime Trust was disbanded. 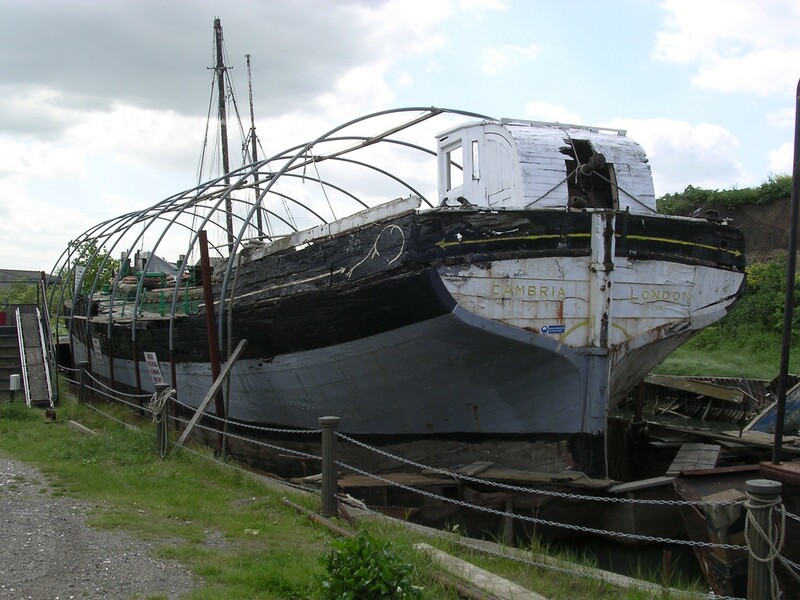 Agreement was reached to move CAMBRIA to the Dolphin Sailing Barge Museum at Sittingbourne and in 1996 she was sold for £1 to the Cambria Trust. 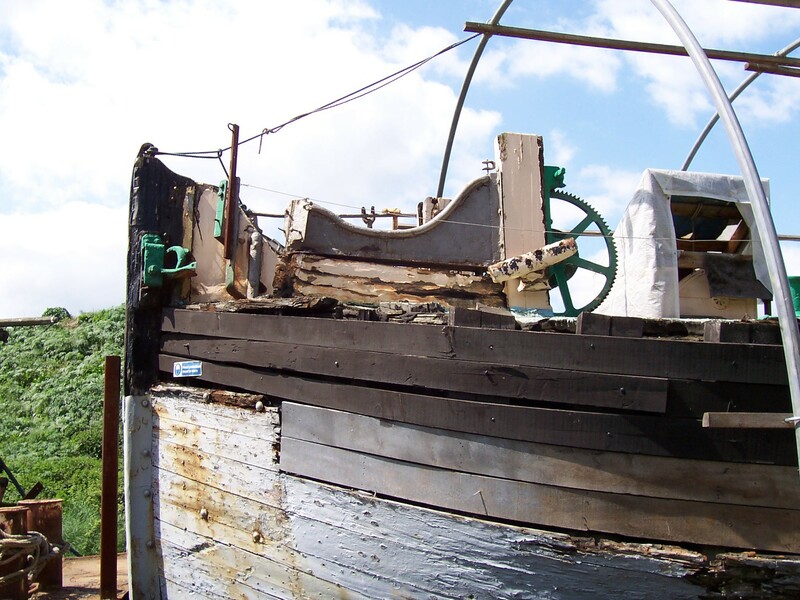 Attempts at restoration were thwarted by lack of funds, and the barge’s condition continued to deteriorate until a major rebuild became necessary. 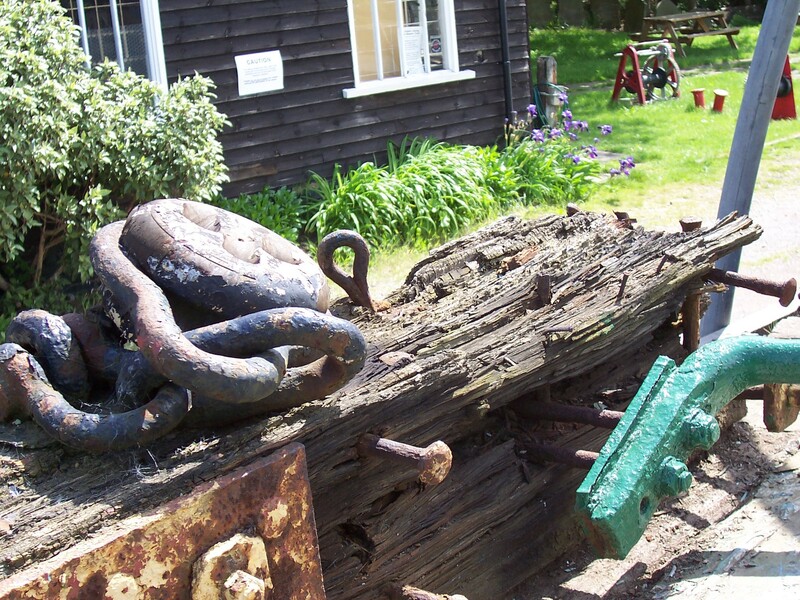 Applications for funds were prepared and in 2006 the hundred-year old barge was towed from Sittingbourne to Sheerness dockyard. In March 2007 the Heritage Lottery Fund agreed to award £990,000 towards the restoration of CAMBRIA. 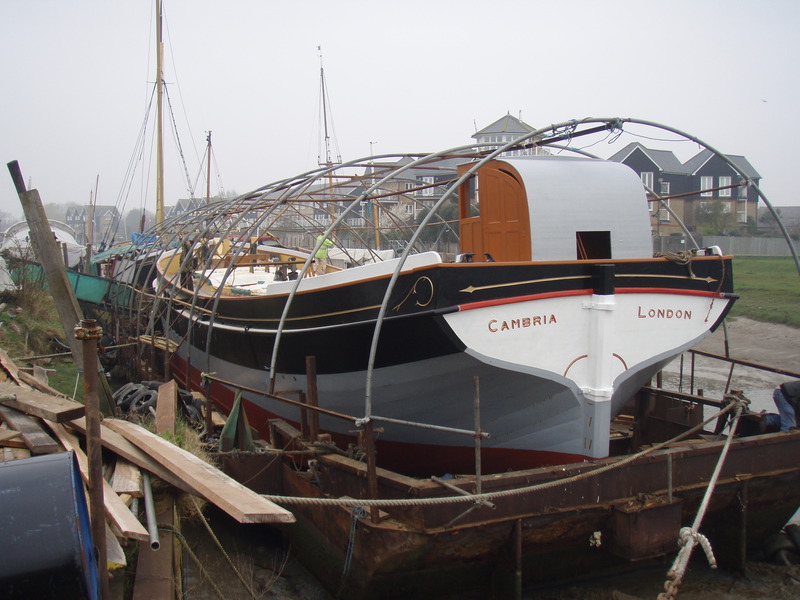 On 1 September 2007 CAMBRIA arrived at Standard Quay, Faversham, aboard a lighter, for restoration. In the following month the first consignment of sawn oak arrived at the quay, part of a donation of 35 oak trees from private sustainable forests in Somerset. 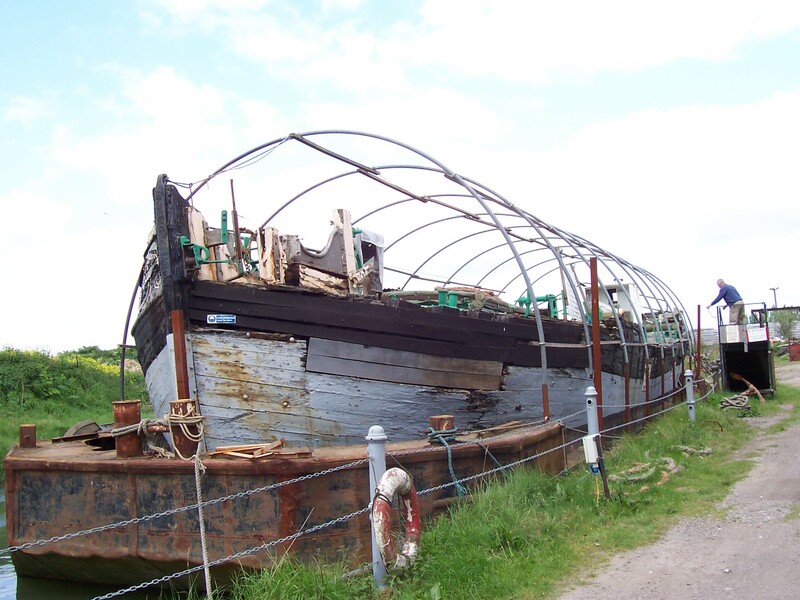 With the vessel surrounded by a steel walkway and covered by a polytunnel, restoration commenced in November 2007. 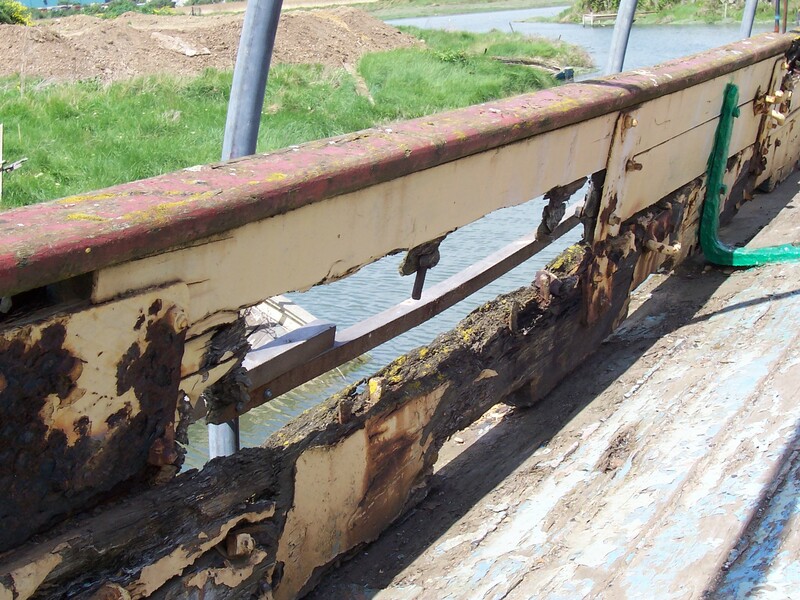 The steel keelson was heavily corroded at each end and could not be saved. 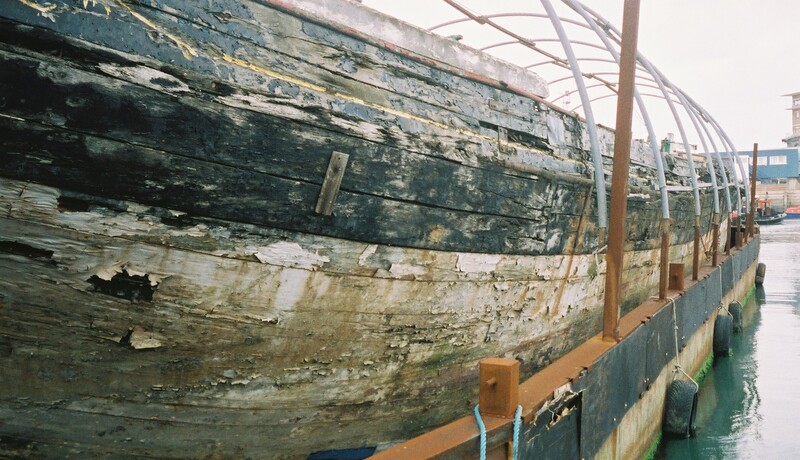 However, the original keel and floor were in good condition and formed the base from which reconstruction could commence. 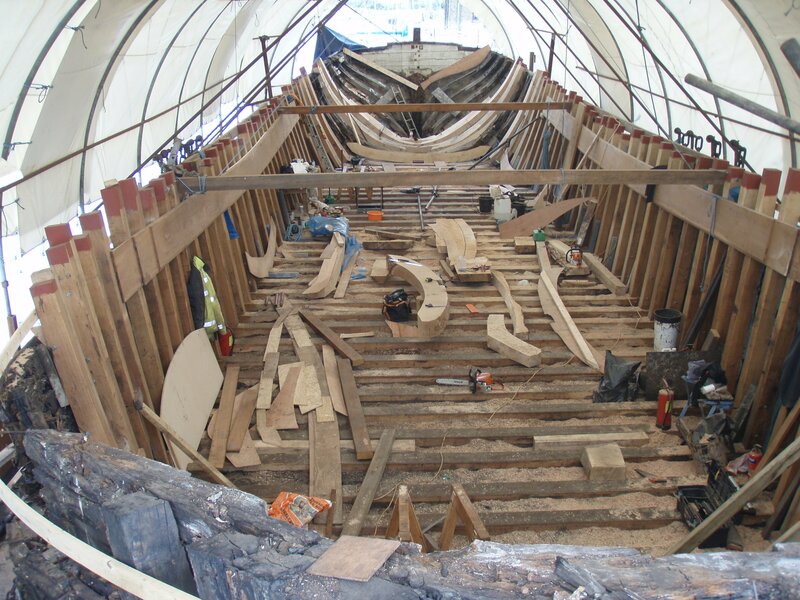 Three years later, by November 2010 restoration of the hull, which had involved replacing all of the frames and most of the planking, was virtually complete and work soon started on the interior accommodation and rig. The project also involved the training of apprentice shipwrights and engineering students in traditional wooden boat-building skills. 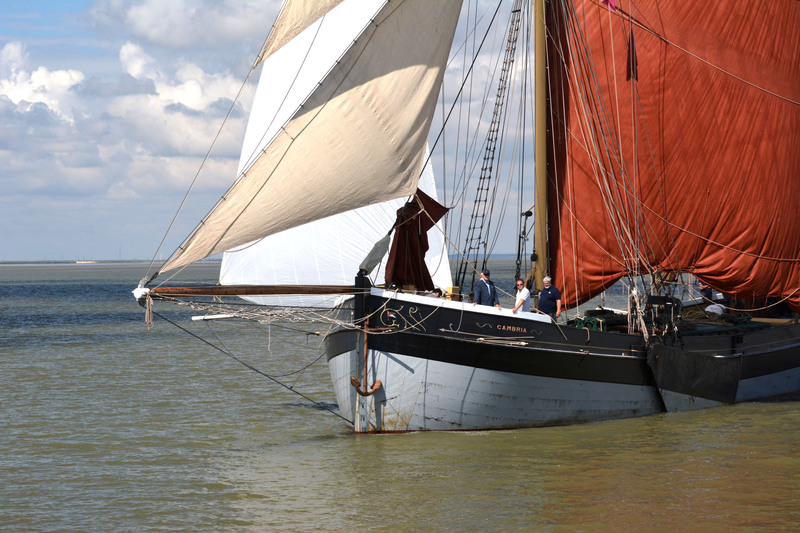 The Cambria Trust intends that the bargewill be used for sail training and educational purposes, giving a new and young audience practical experience of working her under sail alone. This will include social outreach programmes for the disadvantaged youth. 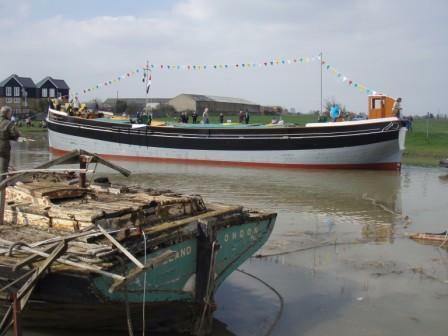 CAMBRIA will also act as a floating classroom at a variety of locations on the Thames, Medway and Swale estuaries in conjunction with local and port authorities and charities, thus facilitating day visits by schools whilst minimising travel. Her main hold has been converted into an interactive education centre capable of seating 40 children at a time, and she will serve as an interpretive centre explaining the economic and social history, and the present and future use, of the London River to junior school pupils. She will also be available for corporate events and the interest and support of the public will also be sought. 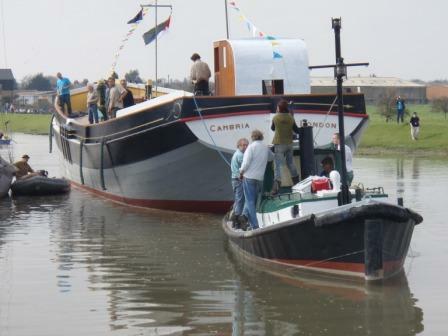 On 21 March 2011 CAMBRIA was re-launched at Faversham and began two months of fitting out. 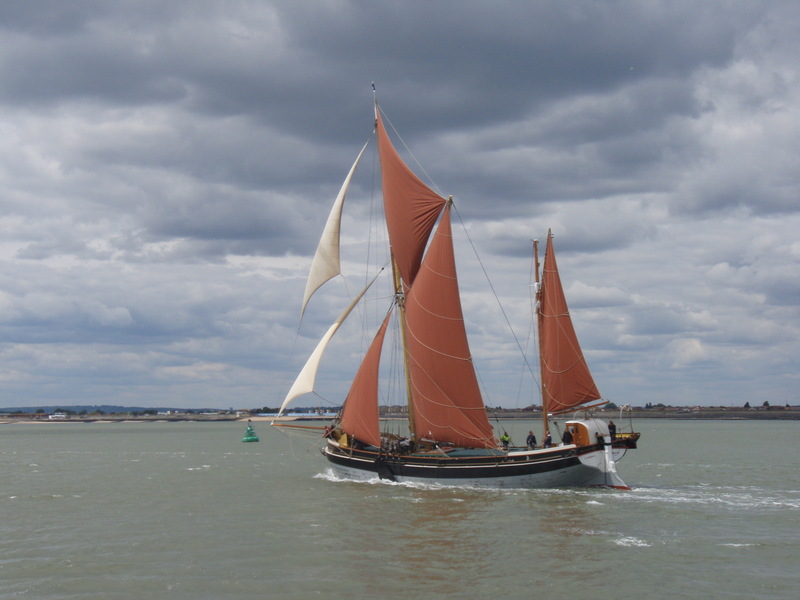 She won the coasting class in the 2011 Thames barge match.